Discussion in 'Comic Books and Graphic Novels' started by TheIncredibleHulk, Feb 26, 2006. Anybody ever heard of this book? It covers every character that appears in the Kingdom Come series. Plus interviews and sketches from Earth X. I got a copy of it years ago when I worked in a comic shop. I've been trying to find out anything I can on it. I've been able to find out very little on it. I know it's very rare. I read something about DC Comics didn't like something about it so they stopped it mid-shipment. Only the first shipment of the books arrived at comic shops, which is how I got my copy. I've searched Ebay, Google, and even called a few of the local comic shops. Not very much luck at all, and the shops have never heard of it. So I figured I'd see if anybody on here knows anything about it. 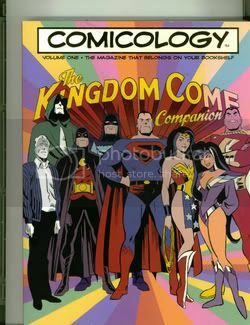 It has the main Kingdom Come characters drawn as the Super Friends on the cover. I'd love to know how much it's worth. i can see why DC would stop it....if there was sketches of Earth X, they dont want the other people getting a part of it. A Mavel alt future series (or 3) that Ross did designs and covers for. Yep, thats it. I've been trying to find stuff on it for a while now. I've searched Google, Ebay, and taken it to a few comic shops. Never found out much. Never thought to check Amazon. He he ... I actually just got my copy and it rocks. Great book. Amazing in detail. 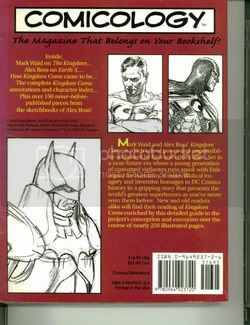 If you want to know about Kingdom Come this is the book, bar none. This is what should have been in the Absolute Kingdom Come book.